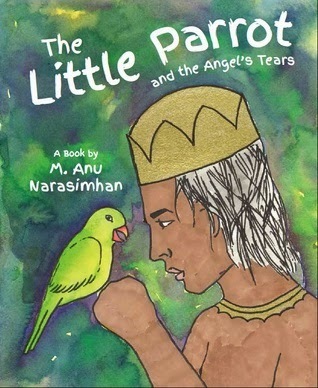 Today we are interviewing M. Anu Narasimhan about the picture book The Little Parrot and the Angel's Tears. I was born in India, raised in the Netherlands, and came here for my undergraduate studies. My mother used to think I was mad (verbatim) because I would just sit for hours and make up stories and then draw them in the air because I didn’t have paper handy. I’ve been writing and illustrating books ever since I can remember. However, this is the first time I’m actually allowing anyone else look and read my creations. The little parrot is very small. He’s smaller than his friend the elephant. He’s smaller than his friend the deer. He’s even smaller than his friend the rabbit. But when his friends and home are in danger, the little parrot decides he has to do something to help. Find out if the little parrot can save them from a big problem. What inspired you to write The Little Parrot and the Angel’s Tears? There are so few books that deal with everyday South Asian narratives and it is those stories that colour our everyday lives that I wanted to pass along to my children. I started out illustrating the stories so I would have a visual aid to tell my kids and that let to me writing The Little Parrot and The Angel’s Tears. What was your approach to illustrating this story? I wanted to use bright colours and draw upon Indian art as my inspiration. For example, I based the flames on the Indian mango motif which is a pattern used often not only in art, but in block prints and relief sculptures. Were you a writer or illustrator first? Or did both talents evolve at the same time? A bit of both, really. All my life I’ve been drawing or writing something. Sometimes an idea inspires me to write something and then make the illustrations accordingly, and other times I really want to paint something and then I create a story around it. I’m hoping everyone will appreciate the book. While the story is South Asian, the underlying concept has a lot of heart and is something everyone can take inspiration from or feel kinship with. Who was your favorite character to illustrate? That’s a tough one, but I loved the elephant. It was much easier to show emotions on the elephant by using body language and facial expression than on the other animals. Additionally, I loved painting the banana trees. We had banana trees and mango trees in our yard when I lived in India and painting them always makes me smile. It’s a picture book, again, but this time with fewer words. It’s about how I used to play in the rain with my friends when I was a small girl. My kids love hearing about what I used to do when I was little and I decided to turn this one into a book as well. I’m about halfway done with the illustrations. Just that I hope they love the story of The Little Parrot and The Angel’s Tears as much as I do. It’s a story that stayed with me always, and helped me always keep faith in myself. I hope it does the same for them. It seemed to them that the parrot wasn’t very bright. Regardless of his size or the dangers that abound.